The live cases are what I like best about attending the AF Symposiums. From world-wide locations via streaming video, we join doctors in their various EP labs while a procedure is underway. The EPs address the symposium audience directly, often fielding questions. We watch these live procedures on floor-to-ceiling high monitor screens. You feel like you are actually in the EP lab with these doctors. While I like live cases the best, they are also my biggest challenge when it comes to writing quality reports. My difficulty is they are often dealing with devices or treatments I have never heard of before. I take notes as best I can while trying to understand and follow the new concepts and treatments. Happily, I can often send my reports to the doctors involved so they can correct any mistakes and misconceptions. I’ve posted my first four reports on the live cases (2 more to come). From Belgium to Boston and Texas to Prague, all relate to performing catheter ablations: a device to protect the esophagus, two related to the Left Atrial Appendage (LAA), and a clinical trial of mapping software to better identifying rotors and drivers. These live cases are probably the closest symposium attendees can come to visiting all of these various global locations and observing these world-class master electrophysiologists and their teams. For many attendees the live cases are often the most innovative and rewarding of the AF Symposium presentations. Looking for all my 2018 reports? Go to my 2018 AF Symposium page (link in the left menu column). by Steve S. Ryan, PhD. Dr. Rodney Horton from the Texas Cardiac Arrhythmia Institute in Austin, TX, demonstrated in a live case how to isolate the Left Atrial Appendage (LAA) using Radio Frequency (RF) energy. Side note: If you been in the EP lab before, the first thing you notice when viewing Dr. Horton at work is no one is wearing the lead aprons and protectors required when using fluoroscopy (x-ray). That’s because he uses 3D non-fluoroscopy (no radiation) imaging techniques. Patient background: An 82-year old male with persistent A-Fib had a previous PVI but still had Flutter. He was also hypertensive. He also had a dual chamber pacemaker. Previously Dr. Horton had isolated the patient’s Coronary Sinus but hadn’t worked on his LAA. Before the live case, Dr. Horton found that the patient had re-connection in one vein which he isolated before the live case demonstration began. Dr. Horton used a mapping catheter in the Left Atrial Appendage (LAA). To isolate the LAA, he used 40 watts radio frequency (RF) energy and a contact force sensing catheter with pressure readings above 10 but not higher than 25. The pressure readings indicate how hard the EP is pressing on the RF catheter to make a particular burn. Dr. Horton rarely isolates the LAA during a first ablation unless he is absolutely sure it needs to be done. He stressed that the phrenic nerve often drops over the top of the LAA. For that reason, he doesn’t ablate too deep into the LAA but ablates at the base of the LAA. …he isolated the LAA and the Flutter disappeared as we watched. There was excitement and clapping when he isolated the LAA and the Flutter disappeared as we watched. Dr. Horton demonstrated for all the attendees that the LAA should also be mapped and isolated. And that isolating the LAA can be very effective in returning a patient to normal sinus rhythm. Instead of fluoroscopy, Dr. Horton uses a non-radiation 3D imaging technique called Intracardiac Echocardiography (ICE), a form of ultrasound. On a personal note, Dr. Horton has said that not having to wear those heavy lead aprons would probably add 5-10 years to his ablation career. Importance of the LAA in Isolating A-Fib: More and more EPs are realizing how important the LAA is in mapping and isolating non-PV triggers. Many Master EPs after isolating the PVs, now go right to the LAA as their second isolation target. 2018 AF Symposium Live Case: RADAR―A Software Breakthrough in Identifying A-Fib Rotors and Drivers? ‘RADAR’ may lead to the next big breakthrough in electro-magnetic imaging analysis software for mapping and ablating A-Fib rotors and drivers. RADAR stands for Real-Time Electrogram Analysis for Drivers of AtRial Fibrillation. The RADAR Clinical Trial is a prospective, non-randomized, investigational device exemption (IDE) study evaluating new analysis software in patients undergoing catheter ablation for persistent Atrial Fibrillation. This special software algorithm is made by AFTx, Inc. The software employs an A-Fib pattern recognition algorithm which can assess what is happening in a particular location within the heart. Then it geometrically stitches together the whole heart chamber to the highest available contact electrograms which results in a high-density 3-D map of the atrium in A-Fib. Dr. Vivek Reddy from Mount Sinai, New York City, calls the resulting map a ‘PADA’ (probabilistic atrial driver assessment) map showing rotors and focal impulse areas. Dr. Reddy introduced Dr. Petr Neuzil from Prague, Czech Republic who performed the live case. Patient Background: The patient was in paroxysmal A-Fib but had suffered a stroke in November 2017 and was on anticoagulants. First, a standard PVI was performed. Then the spiral mapping catheter was used to map and ablate non-PV triggers (using the Abbott EnSite Precision™ cardiac mapping system). While watching the live case, when an effective transmural ablation was completed, a green dot appeared. After several ablation applications, a line appeared to connect the green dots. This apparently made it much easier to assess contiguous lesions. A blue dot represented the latest ablation point. A red dot indicated a possible non-transmural lesion. Dr. Neuzil’s surgical team in Prague was still ablating the patient when the time block for the live case ran out. Making continuous lesions is critical to an effective ablation. But first the ablation sites must be accurately identified and mapped. Easier and More Reliable: Not only does the RADAR system produce a very accurate, highest density map of the atrium, but the green dots and the visible line between them makes it much easier and more reliable to assess whether lesions are contiguous (no gaps). History Being Made? Here is yet another instance where attendees at the AF Symposium 2018 were possibly seeing history being made. The RADAR system may be the next big breakthrough in mapping and ablating A-Fib rotors and drivers and may be a major advance in the treatment of A-Fib. Background: An esophageal atrial fistula is a very rare (about one in 2,000 cases) but often deadly complication. During a catheter ablation, the esophagus, which rests next to the heart, can be injured when heat from the catheter irritates it. The thermal damage can appear 2-3 weeks after the ablation when a hole forms between the atrium and the esophagus. This weakened area of the esophagus can be eaten through by acid reflex with deadly consequences. Demonstrated during a live presentation via streaming video, the DV8 Retractor from Manual Surgical Sciences could eliminate the danger of esophageal atrial fistula. The DV8 Retractor is an inflatable balloon retractor system that moves the esophagus away from the site of ablation. Drs. Kevin Heist, Conor Barrett and Moussa Mansour from Massachusetts General in Boston, MA demonstrated this simple, effective way of protecting the Esophagus from thermal injury during an ablation. We watched as Dr. Heist and his colleagues inserted what looked like a thin straight silicon tube into the patient’s esophagus. (The esophagus is a flexible structure and moves naturally.) They then inflated the device which formed a bend or loop and pushed the esophagus as much as 40 mm away from the ablation site. The device could also be maneuvered up and down to further increase the deflection from the ablation site. DV8 Retractor from Manual Surgical Sciences : Uninflated (L), Inflated (R). The device has two ports―one for balloon inflation/deflation and a separate one for contrast injection into the esophagus to check placement. Dr. Mansour stressed that this device should be used in all ablations. Even though esophageal fistula is a very rare complication (around one in 2,000 cases), there is now no reason for the esophagus to ever be damaged during an ablation. Editor’s comments: Unfortunately there is no way to require EPs to learn about and used this device. What this means to patients: If you are having an ablation, make sure your center and EP have and use this or another esophageal protection device. If they don’t, you shouldn’t proceed. You MUST go elsewhere where they do!!! It makes no sense to risk an esophageal injury when it is so easily prevented. A topic of great interest to A-Fib patients. An interesting debate between Dr. Francis Marchlinski of the Un. of Pennsylvania Health Center in Philadelphia, PA and Dr. Elaine M. Hylek of Boston Un. Medical Center. • Dr. Francis Marchlinski took the “Yes” position (anticoagulation can be stopped). • Dr. Elaine M. Hylek took the “No” position (anticoagulation should not be stopped). In general, he said patients don’t want to have to take anticoagulants, especially after a successful ablation when they are A-Fib free. They are reluctant to take anticoagulation in the absence of EKG and other methods of monitoring when combined with no symptoms of A-Fib. Though labeled a friendly “debate”, there was no debate winner or loser; It was a more dramatic way of presenting different views on anticoagulation and ablation. Note: Usually the first person in a debate is at a disadvantage. But Dr. Marchlinski instead anticipated what points Dr. Hylek would make and addressed them in his presentation. • …there are some observational studies and registries that indicate there is a high risk of stroke when stopping anticoagulation after an ablation. He countered by pointing out that many of these studies included patients who still had A-Fib after their ablation. • …every ablation has recurrences of A-Fib. He said, not in his practice. And in general, this is simply not true. A-Fib ablation has improved significantly over the years. • …recurrences can be asymptomatic. True, so he trains his patients to use pulse assessment and other methods to check for heartbeat irregularities, and if found, to get in touch with his office. He pointed out that the field of monitoring and the increased variety of monitors available makes it less likely that long periods of A-Fib will go unnoticed. 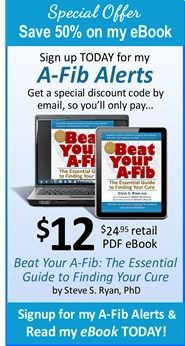 • …A-Fib is a marker for more serious heart remodeling problems like cardiomyopathy, enlarged left atrium, inadequate left atrial contraction, etc. and therefore patients should be on anticoagulants. He countered by describing how carefully he and most other EPs examine a patient’s heart before, during and after an ablation. If any patient has any serious underlying heart problem, they are monitored life-long and are often on anticoagulants for life. • He described using NOACs as a pill-in-the-pocket in certain cases when a patient has a recurrence, so that the patient doesn’t have to be on anticoagulants all the time. • Bleeding risk is still significant, he noted, although the NOACs in general tested better than warfarin. 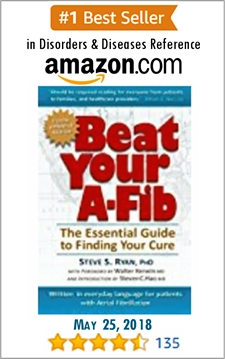 • There is no way to reliably predict recurrences of A-Fib after an ablation. She encouraged the development of a predictive model. • Pulse assessment is not reliable. Too many patients can’t recognize ectopic beats, for example. • She discussed how serious heart remodeling problems can underlie A-Fib, and that these can cause strokes. • Current monitoring is variable and unreliable. We need larger studies to improve this field. Note: Though labeled a friendly “debate”, there was no debate winner or loser; It was just a more dramatic way of presenting different views on taking anticoagulants and catheter ablation. Recurrences are decreasing as ablation improves: With the use of contact force sensor catheters, Cryo and Laser Balloon ablation, advanced mapping techniques, etc., recurrence of A-Fib after an ablation has decreased significantly. A-Fib patients aren’t dumb and can learn to take their pulse: Most patients are smart enough to take their own pulse or use today’s portable DIY monitors to tell if they are in A-Fib. Anticoagulants are high risk drugs: Dr. Hylek didn’t discuss the dangers or acknowledge that anticoagulants are high risk drugs which can cause bleeding problems. For more about how NOACs dosage levels may also need to monitored, see the posted article: New Oral Anticoagulants Can Require Careful Dosing Too on the AFA discussion page. Disclosures: Dr. Hylek lists in her disclosure statement extensive ties to the pharmaceutical industry; Dr. Marchlinski lists ties to medical device makers. About Adagio Medical, Inc.: It’s a privately held medical device company founded in 2011 by Dr. James Cox and Mr. Olav Bergheim. It uses liquid nitrogen to produce ultra-low temperature lesions and developed Near Critical Nitrogen (NCN) technology which permits liquid nitrogen to be used in catheters inside the heart. Check out this excellent animation of the ultra-low temperature iCLAS catheter. With titles and music, illustrates examples of the creation of long and continuous lesions with full transmurality via endocardial approach with small size catheters (≤9Fr). (1:45) Produced by Adagio Medical, Inc.
YouTube video playback controls: When watching this video, you have several playback options. Settings (speed/quality) are located in the lower right portion of the frame, along with the option to enlarge video to full frame. Why is the iCLAS Cryo catheter special and innovative? The iCLAS catheter produces ablation lesions like current CryoBalloon catheters but at lower temperatures (colder). One would expect that such ultra-low Cryo lesions would be deeper, more transmural, and more lasting. In addition, the ability to produce unlimited shapes gives the iCLAS catheter a unique ability to position Cryo lesions in a variety of locations in the heart. It will make ablations much simpler and easier for EPs. Historical! Attendees at this AF Symposium presentation were amazed and astounded by the possibilities of the iCLAS system. Endorsed by Dr. James Cox and Prof. Michel Haissaguerre, it was a historical breakthrough moment that few present will ever forget. Held Jan. 11-13, 2018 in Orlando, FL, the annual International AF Symposium is an intensive and highly focused three-day scientific forum which brings together the world’s leading medical scientists, researchers, cardiologists and electrophysiologists to share the most recent advances in the treatment of atrial fibrillation. The 45 distinguished faculty were leaders in the Atrial Fibrillation field from around the world (the U.S., England, Canada, France, Italy, Germany, Switzerland, Ireland, The Netherlands, Russia, Taiwan, South Korea, the Czech Republic, and two members of the U.S. FDA [Food and Drug Administration]. I made it to every presentation despite being sick with some kind of a virus I caught on the plane to Orlando. I was running on fumes. KISS OF DEATH FOR FIRM? In a late-breaking presentation, the interim results of REAFFIRM trial were presented by Dr. John Hummel from the Ohio State University Wexner Medical Center. The success rate for PVI plus FIRM was not significantly different (78%) for patients receiving only a standard PVI (70%). Barring further research, this may mean the end of the FIRM system as an effective player in A-Fib ablation. See my upcoming report for more. Like last year, there was great interest in and examination of the importance of the Left Atrial Appendage (LAA). Four of the six live case presentations dealt with the LAA. Ten of the more than 62 presentations focused on the LAA. The annual AF Symposium is one of the most important scientific conferences on A-Fib in the world. I attend to learn about advances in research and treatments directly from the most eminent scientists and doctors. 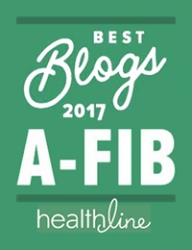 My goal is to offer A-Fib.com readers the most up-to-date research and developments that may impact their treatment choices. The annual International AF Symposium is an intensive and highly focused three-day scientific forum which brings together the world’s leading medical scientists, researchers, cardiologists and electrophysiologists to share the most recent advances in the treatment of atrial fibrillation. Long, Full Days: Held Jan. 11-13, 2018 in Orlando, the AF Symposium days started early each day at 7:00 am and were tightly scheduled with presentations which usually lasted till 5:30 or 6:00 pm (except for a shorter last day so attendees could catch a flight home). Networking: The generous breaks and lunches allowed attendees to interact with and visit the manufacturer’s exhibits to learn what’s new from the many vendors. I made a point of visiting each vendor. Interactive Feedback: Audience feedback was done this year through the Cloud. Presenters would pose multiple choice questions and invite each attendee to cast a vote. The vote tally would be flashed on the screen within seconds for further discussion. In a late-breaking presentation, the interim results of REAFFIRM were presented by Dr. John Hummel from the Ohio State University Wexner Medical Center. The success rate for PVI plus FIRM was not significantly different (78%) for patients receiving only a standard PVI (70%). The sheer technical complexity of producing these live video events is staggering. (As someone who worked in broadcast TV at NBC for many years, I was in awe at how well they pulled off these technological feats.) Each live case came off without a hitch and was integrated seamlessly into the topics and other presentations. The following general topics included several 15 minute presentations on each topic, followed by time for audience questions and discussions. The first presentations dealt with the “basic science” of A-Fib. Often this session provides new insights, advanced research and breakthrough findings. The presentations were excellent, as usual, and well coordinated by topics. Attendance this year was down (about 700 attendees vs. 1,000+). I heard that this was due to new financial regulations in Europe which prevented many from attending. The low attendance was surprising and, discouraging. Can the wonderful AF Symposium continue with such a reduced attendance? Each day one comes away with incredible insights into A-Fib. I’m especially blessed by being able to ask questions of the presenters and dialogue with them. When this gets posted, I’ll be on an 8 am flight from Los Angeles to Orlando. Upon arrival, I hope to pick up my 2018 AF Symposium registration badge and other materials before heading to my hotel for a good night’s sleep (the conference day starts at 7 am and continues into the early evening). The next 3 days will be intense and highly focused. More than 50 of the world’s leading medical scientists and cardiologists will make over 65 presentations, and participate in live procedures via video, and panel discussions. I listen intensively, take loads of notes, make audio recordings (with permission), renew friendships and make new contacts among the over 1,000 international attendees. After the conference (often on my way home Saturday night), I select the presentations on topics of interest to readers of A-Fib.com. In the meantime, you may want to browse my Index to all the Atrial Fibrillation-related medical conferences and symposiums I’ve reported on. You may find a topic of interest. (Or just type your topic into the ‘Search’ box in the upper right corner of every web page and you’ll get a list of results.) For now, go to Index: Steve’s Reports of Atrial Fibrillation Medical Conferences. Look for my first, overview report soon after the conference. When seeking your Atrial Fibrillation cure, you’re often faced with the choices of catheter ablation versus antiarrhythmic drugs therapy. But how do the two treatments compare when it comes to improvement in general health and ‘quality of life’? To determine success after treatment, researchers traditionally measure if A-Fib recurs using periodic ECGs. But this is “hardly a measure of successful treatment”, says Dr. Carina Blomstrom-Lundqvist, principal CAPTAF investigator from Uppsala University in Sweden. CAPTAF stands for ‘Catheter Ablation compared with Pharmacological Therapy for Atrial Fibrillation‘. The CAPTAF clinical trial is one of the first studies in which improvement in ‘quality of life’ was the goal. The trial compared the Atrial Fibrillation treatment effects of ablation versus antiarrhythmic drugs. One-year results were presented in August at the 2017 European Society of Cardiology (ESC) Congress. The CAPTAF trial enrolled 155 symptomatic patients with paroxysmal or persistent A-Fib at four Swedish centers and at one center in Finland. All enrolled patients had to have failed one drug therapy (rate or rhythm control). The average age of the enrolled patients was 56 years. Nearly three-quarters had paroxysmal A-Fib. On average they had been diagnosed with A-Fib for about 5 years, and 70%-80% of the patients had severe or disabling symptoms. The primary goal of the study was a change in general health-related quality of life. Overall Health: After 12 months of follow-up, the ablation group showed a greater improvement in average overall health by 11.0 points versus 3.1 points improvement in the drug group (as measured by a standard survey instrument). The 8-point difference in gain between the two groups was statistically significant. Quality of Life: The quality-of-life domains (general health, physical function, mental health, role-emotional, role-physical, and vitality) improved significantly more in the ablation group than in the drug group. No significant differences were shown in the remaining two domains (bodily pain and social functioning). AF Burden: The AF burden of the ablation group was decreased by an average of 20% points versus 12% points among the group on antiarrhythmic drugs. The change from baseline did not reach statistical significance between treatment groups. The complication rates were comparable between treatment groups. About the difference in quality of life, Dr. Carina Bloomstrom-Lindqvist, principal CAPTAF investigator, explained that continued treatment with an antiarrhythmic drug in the drug group of patients compared with no drug treatment in the ablated patients “is absolutely the explanation” for the observed difference in quality of life. The CAPTAF clinical study, though small, goes much further than previous studies and is a significant milestone for Atrial Fibrillation patients. This was one of the first studies to focus on quality of life after treatment. The CAPTAF results prove scientifically that ablation works better for A-Fib patients than antiarrhythmic drugs (AADs). If you have A-Fib and want to improve your quality of life―get a catheter ablation. It makes you feel better than a life on antiarrhythmic drugs. to have a heart that beats normally again. Blomstrom-Lundqvist, Carina. 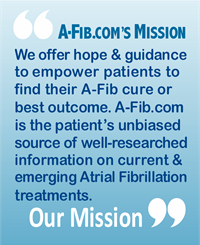 Ablation of Atrial Fibrillation Improves Quality of Life More Than Drugs (CAPTAF). Presentation. ESC Congress, August 2017. CASTLE AF Study: Live Longer―Have a Catheter Ablation! Catheter ablation actually reduces death rates and hospital admissions. That’s the finding in the CASTLE AF trial, a key heart disease study, by Dr. Nassir Marrouche and his colleagues. In a presentation at the 2017 European Cardiology Congress in Barcelona, Spain, Dr. Marrouche described CASTLE-AF study participants as having A-Fib, advanced heart failure (i.e. low ejection fraction) and an Implantable Cardioverter Defibrillator (ICD). The multicenter CASTLE-AF trial focused on patients with A-Fib and systolic heart failure. The CASTLE-AF trial enrolled 398 patients in 33 sites across Europe, Australia and the US between 2008 and 2016. Patients were randomized to receive either radiofrequency catheter ablation or conventional drug treatment. The study set out to definitively test the ability of A-Fib ablation to improve hard outcomes in patients with symptomatic paroxysmal or persistent A-Fib and a left ventricular ejection fraction (LVEF) of ≤35 percent (dangerously low percent). Median follow-up period was 37.8 months. After catheter ablation, the death rate of trial patients was lowered by an amazing 47%! This is a lot better result than research studies using ICDs with drug therapy to lower the death rate in similar patients. Before this study, catheter ablation was known to improve quality of life, but in this study it also improved life outcomes (the quantity of life, how long one lives). In addition, there may be a “major impact” on reducing costs associated with hospitalizations. Once we study the soon-to-be published CASTLE-AF results, we can document what we’ve often observed anecdotally, that catheter ablation improves lower-than-normal ejection fraction and consequently cures a major component of heart failure. My Anecdotal Evidence: Just last month I advised a 73-year-old man in persistent A-Fib to have an ablation by Dr. Andrea Natale. After only one month in sinus, his ejection fraction improved from a low 35% to a normal 55% (normal range is 50 to 75 percent)! The CASTLE-AF study could pave the way for wider adoption of catheter ablation for treatment of A-Fib. Even though he’s only a month into his blanking period, he feels terrific. Wider Adoption of Catheter Ablation? The CASTLE-AF study results could be a game changer for Atrial Fibrillation patients! Results could pave the way for wider adoption of catheter ablation and may prompt changes in current guidelines for treatment. Marrouche, Nassir. Castle AF: Catheter Ablation vs. Conventional Therapy for Patients with A-Fib and LV Dysfunction. Presentation at the 2017 European Society of Cardiology (ESC) Congress. August 27, 2017. If someone has A-Fib, should all their immediate family members be screened for A-Fib? Since in the US alone over three million people have A-Fib, it isn’t possible or practical to screen all family members for A-Fib. And even if we could screen everyone, we don’t yet have the means to prevent A-Fib from developing or even to identify patients with pre-A-Fib. Editor’s Comments: If anyone in your immediate family has A-Fib, you are very likely to develop A-Fib yourself. You have to be more aware and vigilant than the average person. If, for example, you feel palpitations or a racing heart rate, take it very seriously. 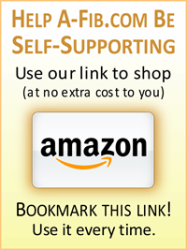 Don’t hesitate or delay in going to an Electrophysiologist (EP) to have yourself checked out. Make sure you tell your EP or Cardiologist that your relative has A-Fib. People with a particular combination of 3 genetic variants on chromosome 4q25 are six times more likely to develop A-Fib. Are these chromosomes associated with and/or do they cause an increased risk of A-Fib stroke, heart failure and death? Are these genetic variants associated with or do they indicate that a certain treatment should be used or that a certain outcome is more likely? How important are these genetic variants in the development of A-Fib? How do these genetic variants affect what types of arrhythmia develop? Do Paroxysmal A-Fib, Permanent A-Fib, or A-Flutter have different genetic profiles? And most importantly, how do these genetic variants work? What Is the mechanism behind the association? Avoid binge drinking and heavy partying. Be more attentive to overall health. Obesity, for example, is often a contributing factor to A-Fib. Sleep apnea is known to lead to A-Fib. Check for deficiencies in essential minerals (electrolytes) like magnesium or potassium? Are calcium levels too high (which may be a trigger for A-Fib)? Avoid or learn to cope with stress (not always possible). There is a tendency in all of us to not tell others if we are ill, perhaps because we perceive it as somewhat humiliating and a weakness in ourselves. But no one should be ashamed of having A-Fib. Most likely it isn’t anything we brought on ourselves. It’s genetic! It’s nobody’s fault! We are not being fair to our family members by not telling them about our A-Fib. Don’t just mention it in passing. 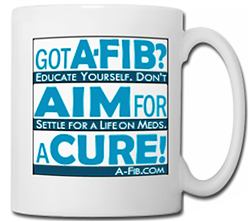 Sit down with them and tell them what A-Fib is like, and that they are at risk. If you love your family, you owe it to them. This applies particularly to your brothers and sisters with whom you may have a loving but somewhat competitive relationship. Anyone in your immediate family must be warned. Dr. Wilber described how he first does voltage mapping while the patient is in normal sinus rhythm. He started in the right atrium, then moved to the left; he used the FIRM system to map where rotors were coming from. (In patients with persistent A-Fib, he typically finds as many as 4-8 rotors.) He mapped and ablated until there were no more rotors. Only after using the FIRM system did he do a Pulmonary Vein ablation…Continue reading my report. In a live case, Dr. David Wilber from Loyola Un. Medical Center in Chicago, IL showed how he uses the Topera FIRM rotor mapping system to identify rotors in conjunction with a PVI. ‘FIRM’ stands for Focal Impulse and Rotor Modulation. FIRM mapping display of left atrial rotor during atrial fibrillation. In live video streaming from Chicago, Dr. Wilber described how he first does voltage mapping while the patient is in normal sinus rhythm. He started in the right atrium, then moved to the left; he used the FIRM system to map where rotors were coming from. (In patients with persistent A-Fib, he typically finds as many as 4-8 rotors.) He mapped and ablated until there were no more rotors. Only after using the FIRM system did he do a Pulmonary Vein ablation (PVI). He explained that the concept of terminating A-Fib during a PVI ablation doesn’t work with the FIRM system. Instead, he looks to ablate rotational areas (which are usually 2.2 cm across). He does this by using a Contact Force sensing catheter usually at 35 watts for 30 sec. VIDEO examples: Dr. Wilber showed a video using FIRM in which [even to my untrained eye] it was easy to see a rotor. But he showed other videos where the overlapping, swirling waves made it difficult to see where exactly a rotor was coming from. This patient was at great risk of recurrence after a catheter ablation, because of his various illnesses (comorbidities). By restoring him to normal sinus rhythm, he would be able to exercise and develop life-changing habits to reduce his obesity, diabetes, and hypertension. Abbott Topera FIRM vs Medtronic ECGI CardioInsight: In comparison to the ECGI CardioInsight system where the rotors and focal sources are very obvious (even to untrained observers), the FIRM system display of rotors are often confusing and hard to identify. Dr. Wilber acknowledged that it takes study and experience with the FIRM system to use it effectively. To me, the Abbott Topera FIRM system seems hard to use. In head-to-head competition with the Medtronic ECGI CardioInsight system, I predict the FIRM system will probably not survive. The Medtronic ECGI CardioInsight system has been in limited use in Europe and in 2017 has begun a limited rollout in the U.S.
For more on the Medtronic ECGI CardioInsight, see my article: ECGI Mapping Now Available in U.S.
For more about Dr. Nassir Marrouche’s Utah I–IV Classification System, see my article: Fibrosis Risk and the U. of Utah/CARMA website.